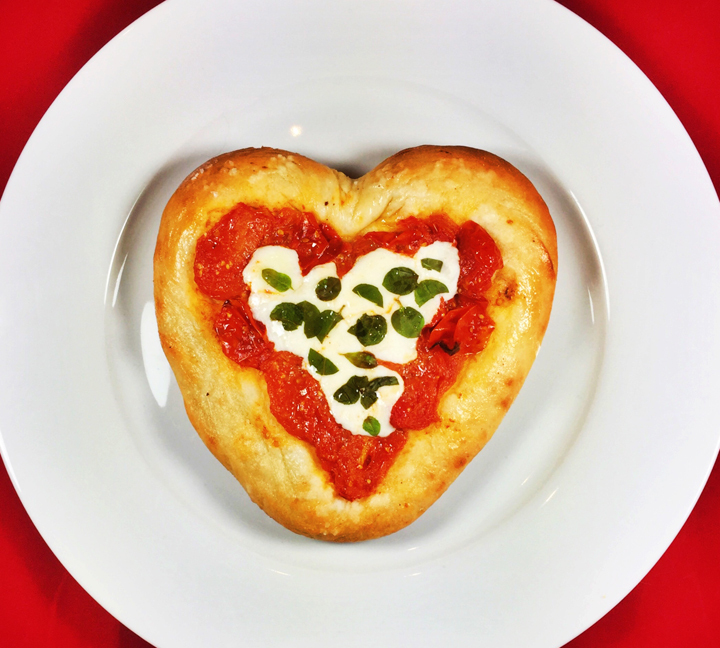 These little heart shaped Pizza Margheritas are as tasty as they are cute and perfect to make as a special treat for a loved one. Or prepare them on a family night as a fun way to celebrate Valentine’s Day. Cherry tomatoes are perfect for this sweet little sauce; plus, it’s so simple it can be made while the dough rises. Short on time or you don’t want to make pizza dough? Just purchase store-bought fresh or frozen ready-made pizza dough. If making your own pizza dough – In a stand mixer with a dough hook, combine the 1¼ cups of warm water (must be between 100-110 degrees for the yeast to bloom), yeast, honey, and 3 tablespoons of olive oil in the work bowl. Allow the yeast to dissolve and bloom for about 5 minutes, and then add 3 cups of bread flour, 2 teaspoons kosher salt, and mix on medium-low until combined. Continue kneading the dough in the mixer bowl for 10 minutes, sprinkling it with the flour as necessary to keep it from sticking to the sides of the bowl, so it forms into soft smooth dough. After 10 minutes, turn it out onto a floured surface and knead it by hand until smooth and elastic. Place the dough in a well-oiled bowl and turn it to cover it lightly with oil. Cover the bowl with a kitchen towel and allow it to rise at room temperature for 30 minutes. Preheat the oven to 500 degrees; cover 2 sheet pans with parchment paper. To make the sauce, heat a large sauté pan over medium high heat. When hot, add the oil, then the tomatoes immediately, rolling them around the pan to cover in oil. Keep shaking them in the pan as they blister on all sides. When blistered with brown edges, reduce the heat to medium and let them simmer for about 4 minutes or until then start to pop. Crush all the tomatoes and reduce the heat to low, cook for about 4 more minutes to thicken and soften. Set aside. Turn the dough out on a floured board. Cut the dough into 6 even pieces and let rest, covered with a towel for 10-15 minutes. Stretching the dough, shape each piece into a heart shape and place on the parchment paper. Brush lightly all over with olive oil and sprinkle over a pinch of salt. Add about 3 tablespoons of the cherry tomatoes evenly in the center of each pizza and spread, leaving an edge for the crust. Add the cheese and sprinkle over with the basil leaves. Bake one sheet pan at a time in the center of the oven for 10-12 minutes until the crust is browned on the bottom and sides. Braising is the perfect method for cooking on a cooler day. Usually reserved for tough cuts, whole chicken legs are another ideal option. The meat becomes tender while taking on the flavor of the braising liquid. 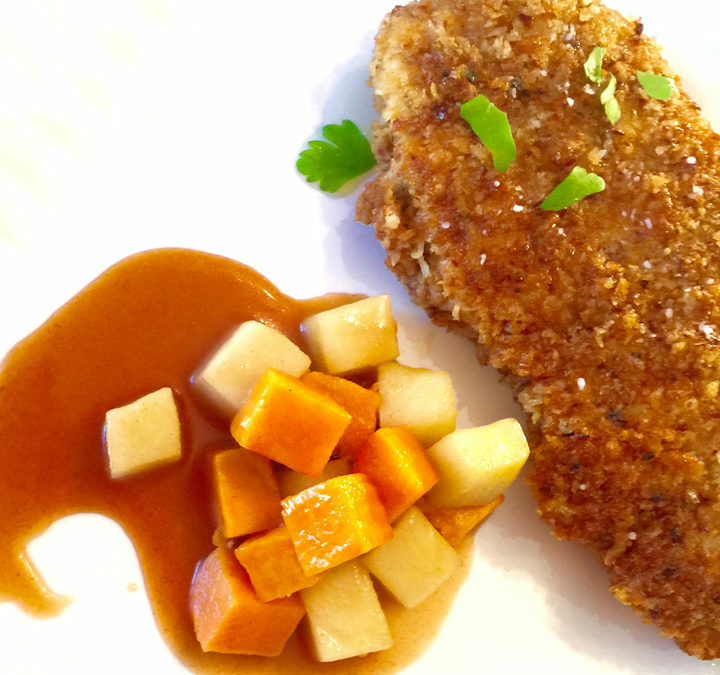 The reserved liquid is then reduced to create a tasty sauce to baste on the chicken and create a beautiful glossy finish. The addition of cilantro rice helps balance out the dish. If you don’t care for cilantro, you can substitute parsley. Using a vegetable peeler, remove 4 long strips of orange peel off the orange. Try to peel just the surface and avoid getting any of the white pith. Set the orange aside to use as juice and reserve the orange peel strips. 30 minutes before cooking, season the chicken on both sides with kosher salt. Preheat the oven to 450 degrees. Place the chicken in an even layer in a shallow oven- proof pan. Roast in the oven for 20 minutes until the skin just starts turning golden brown. Remove the chicken from the oven and reduce the heat to 300 degrees. Take the chicken out of the pan and set aside on a plate; cover the chicken to keep warm. Reserving all the drippings in the pan and set the pan on the stovetop over medium heat. Add the onion to the pan drippings with a pinch of salt and sauté until the onion is translucent, about 3 minutes. Add the carrots, garlic and ginger and sauté for a couple more minutes. Add the wine, scraping up any browned bits stuck to the bottom of the pan. Add the orange juice, peel, star anise and bay leaves, and then add the chicken back into the pan. The liquid should cover the sides of the chicken. Heat on high to bring to a simmer; cover with a lid or tightly with foil and place in the oven. Bake for 45 minutes until the internal temperature of the chicken thigh reaches 165 degrees. Remove the chicken from the oven. Take out of the pan and place, skin side up, on a broiling pan and set aside. Preheat the broiler in your oven. Strain the remaining liquid through a fine mesh strainer; discarding any solids. Pour the liquid into a cup or fat separator; remove the fat from the liquid. Add the liquid into a clean saucepan; discard the fat. Bring the liquid to a boil on medium high and cook until it is reduced in half. Add the hoisin sauce, fish sauce, rice wine vinegar, and chinese five spice. Taste and adjust seasonings and then add the cornstarch and water mixture; simmering until the sauce thickens. Place the chicken under the broiler and broil carefully until the skin is browned and crisp. Remove from the oven and baste a few times with the warm sauce. Combine the rice and butter, add the cilantro or parsley and mix completely. 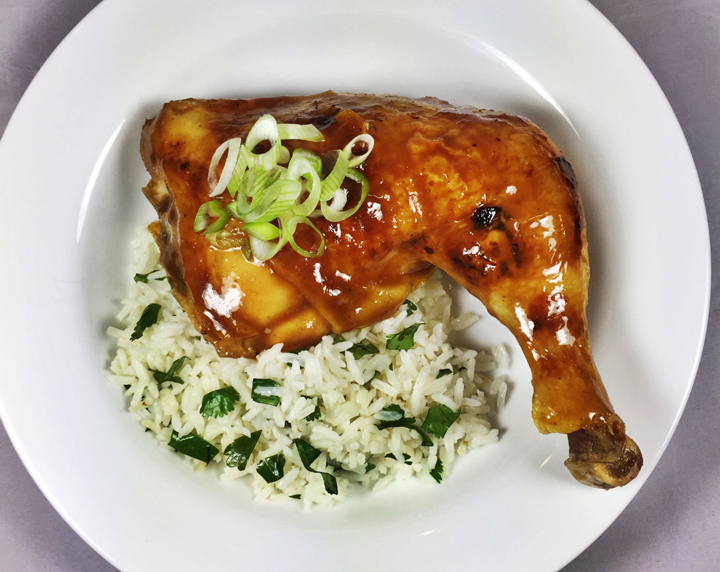 Serve with the chicken, topped with scallions, over the cilantro rice and any leftover sauce on the side. Serves 4. 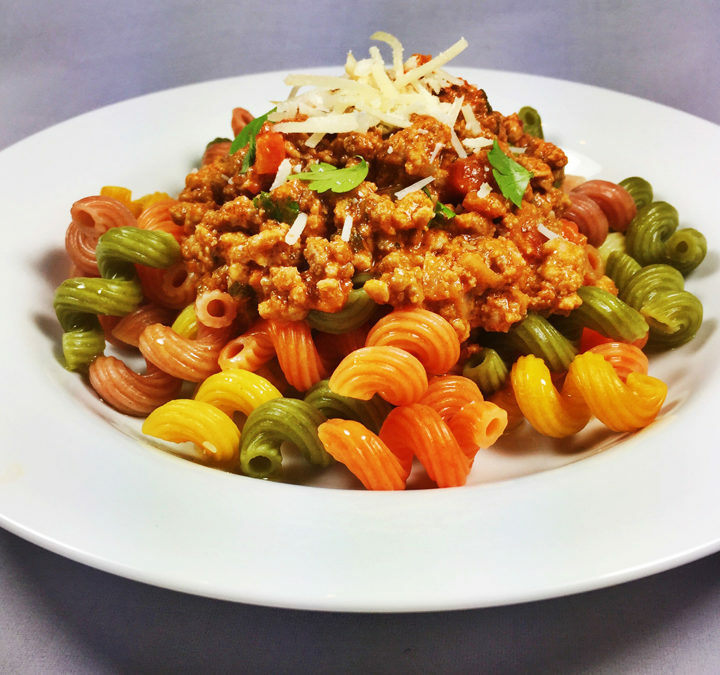 Traditional Bolognese can take two hours or more to simmer to perfection. With the help of a pressure cooker our Bolognese gets done in 20 minutes. These newer models are not your Grandmother’s pressure cooker. They are safer and rocket fast. If you don’t own a pressure cooker you can still follow the recipe and make the dish by using the traditional method. While Spaghetti Bolognese is a popular dish, try using a sturdier noodle to hold up to the thick sauce. Ground veal is available at Whole Foods but if you prefer to not use veal you can substitute with more beef. Heat the olive oil in your pressure cooker or a large Dutch oven over medium-high. Add the onion, carrots, and celery and a pinch of salt. Cook until the vegetables are soft, about 5-7 minutes. Add the meats and cook until they have lost their raw color. Add the wine and cook for 2-3 minutes. Add the garlic, tomato paste, and anchovy paste stirring in for another minute. Add the tomatoes, rosemary, oregano and bay leaves. If using a pressure cooker, close and lock following your manufacturer’s directions and set on high. When pressure is reached, cook for 20 minutes. Allow the cooker to return to normal pressure. If using a Dutch oven, reduces the heat to low, cover and cook for two hours and fifteen minutes stirring occasionally. Remove the bay leaves and discard; add salt and pepper to taste. Increase the stovetop heat and add the cream, parsley, and basil, cook for 15 minutes longer. Serve over the pasta and top with the Parmesan cheese. These winter veggies are a delight for your palate – roasted to perfection, then combined with a Fontina cheese filling, and surrounded by a crunchy parmesan cheese crust. Served slightly warm with a side salad, this Quiche makes a comforting winter dinner. Pulse flour, cheese, sugar, salt, and butter in a food processor until mixture resembles coarse meal. Add egg yolk and pulse until just combined. With processor running, drizzle in ¼ cup ice water, then pulse until dough just comes together. If the dough is too crumbly add up to 1/4 cup more water adding only 1 tablespoon at a time until the dough just comes together. Dump the dough on a sheet of plastic wrap, bring it together and shape into a disk. Wrap tightly and refrigerate until cold, about 2 hours. Preheat the oven to 350 degrees. Roll out dough on a lightly floured surface to a 15″ round. Transfer to 9″ spring form pan, easing the sides down into the pan so you don’t stretch the dough. Press onto bottom and up sides of springform pan, then trim the dough even with the top, freeze for 15 minutes. Line the center with non-stick foil or parchment paper and fill with dried beans or pie weights. Place in the oven and bake for 25 minutes. Remove from the oven and remove the foil/parchment and pie weights. Return the crust to oven and bake for 25 minutes longer or until browned. Let crust cool while you make the filling. Increase the oven to 425 degrees. Remove as many outer leaves as possible of the Brussels sprouts and add to a large bowl. Quarter the remaining centers and add to the bowl as well. Add the peppers, onions, and cauliflower florets to the bowl then add 2 tablespoons of olive oil and 1 teaspoon of salt. Toss to mix well. Pour out onto two sheet pans and roast, switching the pans in the oven halfway through, until the vegetables are cooked through and their edges are browned, about 25-30 minutes. Reduce the oven back to 350 degrees. 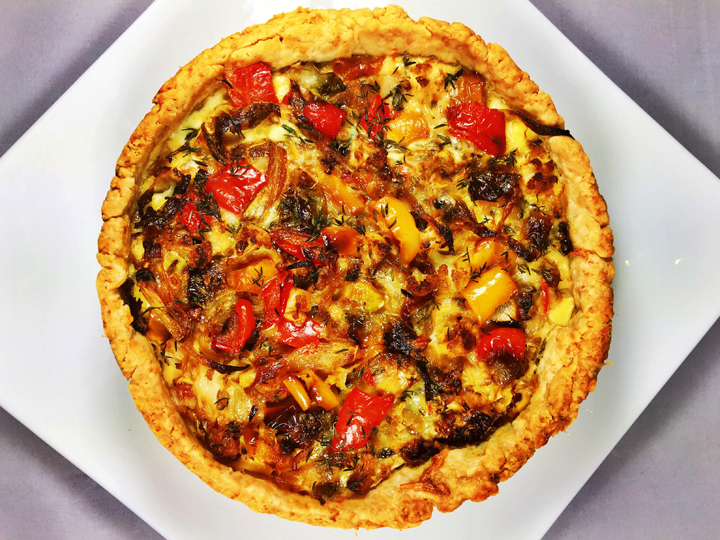 Scatter ½ the roasted vegetables over bottom of tart crust. Scatter 1 teaspoon of thyme over the vegetables and top with ½ the grated cheese. Add the balance of the roasted vegetables and cheese. Whisk eggs, Crème Fraîche and cream in a small bowl. Slowly pour egg mixture over vegetables. Scatter remaining thyme on top. Bake until the filling is set, about 60 minutes. Let stand for at least 10 minutes. Remove the springform and serve warm or at room temperature. Make 8 servings.